Nationals fans might be worried about how they'll get home after Game 5 Thursday night should the game end after Metro closes for the night. Here are several alternate travel options. WASHINGTON — Nationals fans already anxious about Game 5 now have something else to be worried about: getting to and from the ballpark. Regardless if fans blame the Nationals for not creating more travel options or Metro for limiting them, many are thinking ahead to how they’ll get home. With an 8:08 p.m. first pitch, there is the potential for the game to go past midnight, unlike any playoff game so far this season, and fans could miss the last Metro trains of the night. The last trains from the Navy Yard Station are 11:39 p.m. northbound and 12:17 a.m. southbound, according to Metro spokesman Dan Stessel. Game 1 of this series lasted 3 hours and 46 minutes; Game 2, 3:55; Game 3, 4:12, and Game 4, 3:44. 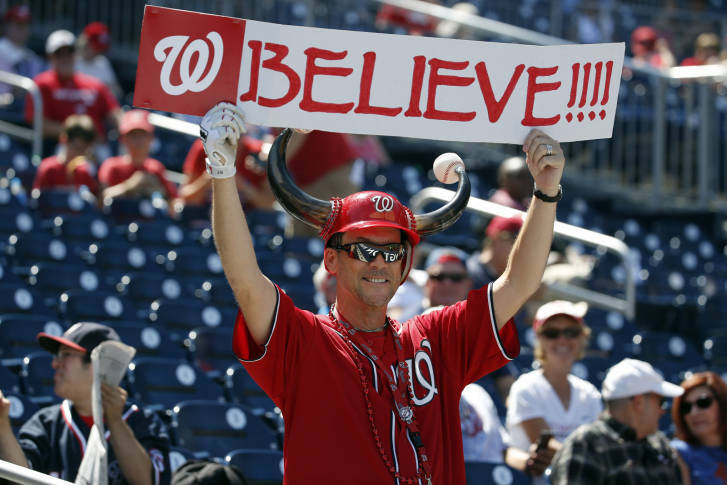 “We recognize that this might take Metro out of consideration for Nats fans (Thursday) night,” Stessel said in an email. General Manager Paul Wiedefeld announced a moratorium on early openings and later closings in May to give track crews more time to perform much-needed maintenance. “Unfortunately this has meant saying no to worthy organizations including Susan G. Koman Race for the Cure, the Marine Corps Marathon and others. (A postseason Nats game is a much smaller scale event in terms of ridership. ),” Stessel’s email said. Here are some alternate travel options. Fans looking to share a ride to the ballpark are using #NatsRide to find each other on Twitter. Thanks to #NatsRide I’ll be getting home from the game with wedding planner extraordinare & Nats fan @bellwetherevent. Thanks @TalkNats2! The later start time means fans are facing the reality Metro will be closed when the game ends and many more will be competing for parking spots. Some 800 drivers have already booked a guaranteed parking spot Thursday night and roughly 400 spaces remain through Parking Panda. At an average of $55 a spot, Mark McTamney with Parking Panda said he expects its partner lots to sell out. Parking restrictions will remain in place to support efficient traffic flow for entry and exit from the ballpark area, according to the District’s Department of Transportation. Traffic signals will be adjusted to accommodate rush hour traffic volume. DDOT will also send out traffic control officers and engineers will staff the Traffic Management Center to adjust staffing and signal timing as needed, said DDOT’s Terry Owens. Fans coming from Alexandria can take the Baseball Taxi for $37 round trip. Two more boats, carrying roughly 100 people, are ready to be put into commission if the demand is there, said Lynn Morris with Potomac River Boats. The ballpark bus to and from Reston Town Center is sold out. Capital BikeShare is an option for fans eager to skip the traffic. Game day corral service will be offered at the First Street and N Street station (across from the Bike Valet) 1 hour before the game begins and until 30 minutes after the game ends. Check Spotcycle for the most up-to-date bike and dock information. Other nearby Capital BikeShare locations are M Street and New Jersey Ave SE, 3rd and Tingey Street SE and First and K streets SE. The D.C. Circulator is operating on special hours until 1 a.m. The Union Station — Navy Yard route is another great option to get you to and from the ballpark. With a convenient stop outside the Navy Yard Metro Station on M Street and New Jersey Avenue SE. The stop is just a short walk to the stadium. After the game, catch a cab at the taxicab stand located on the north side of M Street SE between South Capitol and Half street SE. Guests exiting the Center Field Gate should walk one block north toward M Street. The taxi stand begins operating approximately two hours after the first pitch and remains open until a half-hour after the game ends. For those fans planning on using a ride-hailing service, the Nationals suggest riders pick any location but South Capitol Street, which is a busy thoroughfare and stopping there would be dangerous. Uber suggests app-users meet their driver at N Street and New Jersey Avenue SE or Half and L streets SE. To save on fares after the game, hangout at some of the surrounding eateries or the Bullpen and avoid the postgame rush. Or try uberPOOL and share a lower-cost ride with other fans. To stay safe, confirm the driver’s license plate number and car model before climbing in and share the ride information with a friend.